GBP/USD is rising within familiar ranges. It experiences some calm after the Brexit drama and before the data. The chart shows that downtrend resistance is closing in on the pair. GBP/USD is “hugging” the 1.3100 level, sticking to familiar ranges. After the EU granted a six-month extension to Brexit, markets are calmer and are not busy with asking what’s next, as the next deadline is October 31st, Halloween. Parliament is on recess this week, but talks between the government and the opposition Labour Party continue. Both agree on leaving the EU and to end free movement, while future trade relations remain an issue. Labour wants a customs union with the EU while the Conservatives want to break away from the bloc. The chances of a second referendum are unclear. Sterling traders face a big bulk of top-tier data this week: the jobs report, inflation, and retail sales. However, today’s British economic calendar is empty. In the US, trade talks with China are making progress, with reports on US concessions regarding Chinese government involvement in the economy. The news help boost markets and the risk-on mood keeps GBP/USD bid. The FOMC’s Charles Evans will speak later, and he will likely reiterate the patient stance regarding rates. The Empire State Manufacturing Index is also due, and an increase is on the cards. With low-tier data, the focus remains developments in negotiations between the world’s largest economies and the UK’s largest political parties. GBP/USD is trading below the downtrend resistance line that accompanies it since mid-March. When the price hits the line, will it break or bounce? We will know soon enough. Other indicators are quite neutral, with a lack of Momentum and a stable Relative Strength Index. 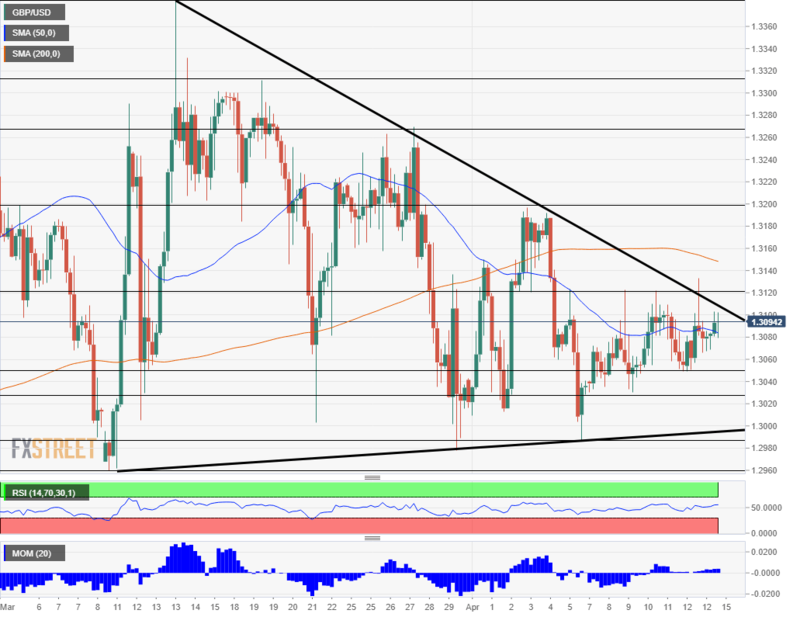 GBP/USD faces resistance at 1.3120 which capped cable twice last week. The 200-Simple Moving Average meets the price at 1.3150, and 1.3200 was the high point in April. 1.3270 and 1.3330 are next. Support awaits at 1.3050 that held cushioned the falls last week. Further down, 1.3130 also served as support. The April low of 1.2985 is the next line to watch before 1.2960, the lowest point in March.